A Snype is a partial screen or full screen animation that can be played at any time during a program. The Snyper can simultaneously playback two Snypes (Foreground and Background) in addition to whatever the main graphic layer may be doing. A Foreground Snype is commonly used to let the viewer know of coming attractions without using your valuable Air Time that could otherwise be sold to advertisers. 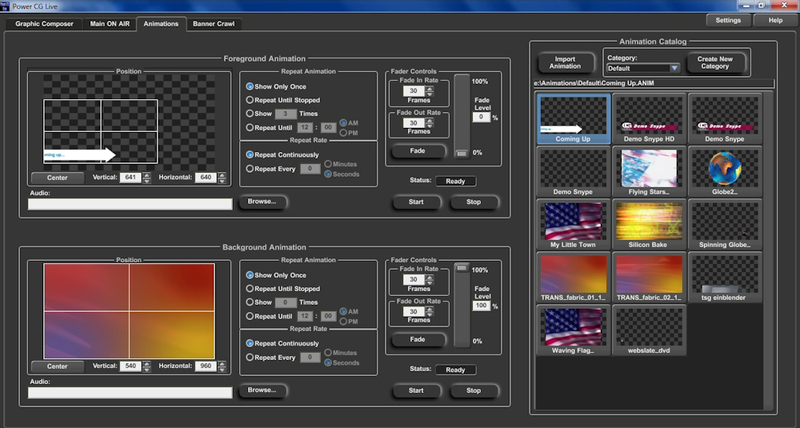 A Background Snype can be used to display an animated background to a graphic. For an example of a Snype See our Demo Snype. Snypes can be displayed completely independently of anything else that Power CG Live is currently doing. Whether it's performing a Credit Roll or displaying a Static title. It's almost like having two CG's that you can use simultaneously without paying for the extra hardware. They can be controlled from either the Graphic User Interface, or by another application using a simple text file. The Snyper will playback Snypes in real time that are stored as Window Media 9 files or Cayman Graphics' proprietary VCLIP format. VCLIP animations can be created using the Title Composer's Text FX feature. VCLIP animations can also be created by importing a TGA Image Sequence that has been created by your favorite 3D Animation program.